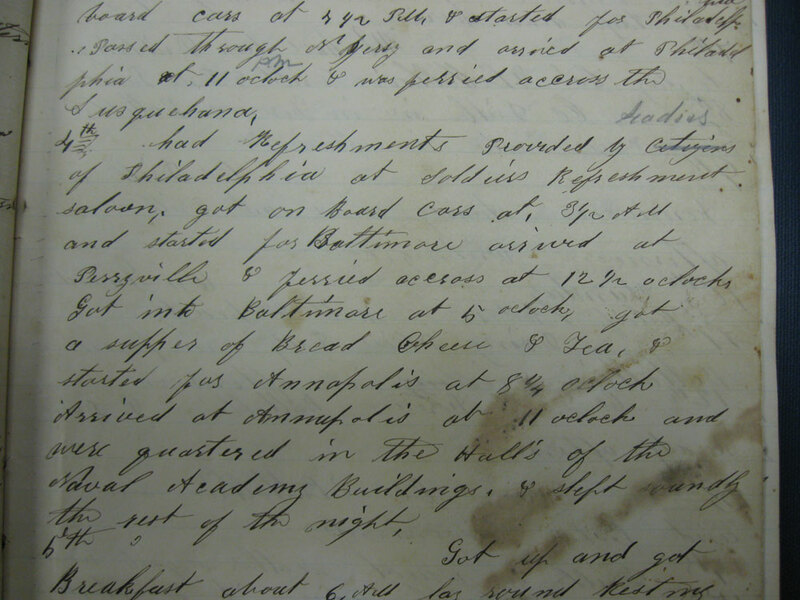 [November] 4th had Refreshments provided by Citizens Ladies of Philadelphia at Soldier’s Refreshment salon. got on Board cars at 3 1/2 AM and started for Baltimore arrived at Perryville & ferried across at 12 1/2 o clocks Got into Baltimore at 5 oclocks got a supper of Bread Cheese & Tea, & started for Annapolis at 8 1/4 oclock Arrived at Annapolis at 11 oclock and were quartered in the Hall’s of the Naval Academy Buildings. & slept soundly the rest of the night. Item citation: Diary commencing Oct. 14, 1861 – ending Sept. 20th, 1863 / Newton Wallace, VCC970.742 W19d, from the North Carolina Collection, Wilson Library, UNC Chapel Hill. More about this item: Eighty-nine page quarto diary, with entries for nearly every day from October 1861 to September 1863 and including entries for distances traveled totaling by Wallace’s figuring 2876 miles. This entry was posted in North Carolina Collection and tagged 27th Infantry (Massachusetts), Annapolis, Baltimore, food, Maryland, Newton Wallace, occupation, Perryville, Philadelphia, Union occupation, Union soldiers, United States Naval Academy. Bookmark the permalink.